Who doesn’t love thin mints? Weirdos. I don’t have to sell these, you know how good they are. And homemade? So delicious. This recipe comes from the blog Ming Makes Cupcakes– whose graphics I love- but i think it no longer gets updated. Nonetheless- this recipe is totally spot on- and very easy. Just like the World Peace Cookies, this dough freezes well and the paper towel roll trick [see Just the Tips] – worked like a charm. P.S. these cookies keep well in the frigde- that way the chocolate doesn’t melt- and remember how good freezing the girl scout ones were? Mix flour, cocoa, salt and soda. In a separate bowl, cream butter until smooth. Add sugar and beat for one minute. Add milk, vanilla, and mint and beat an additional minute. Slowly add the dry ingredients while beating. Once mixture is well-combined and resembles small pebbles. Use your hands to form into a ball. Roll dough into a log and wrap in wax paper. Chill for 2 hours. Slice into thin rounds and place on parchment paper. Bake at 350 for 12-15 minutes. Melt chocolate in a pyrex bowl set above a simmering water and add mint. 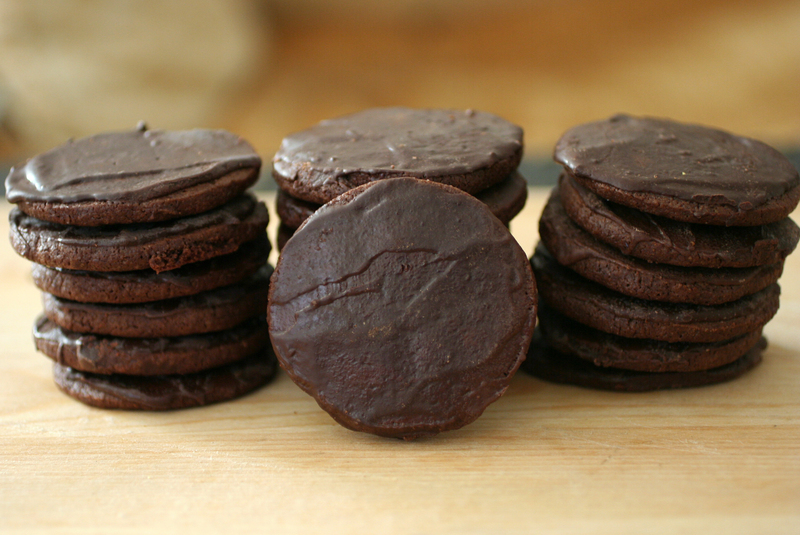 Once cookies have cookies and become crispy, coat their tops in chocolate by dipping them or smearing them w. icing knife. These cookies are divine. Simply scrumptious. Holy eff these things look amazing. Anonymous is impressed. Also, he is anonymous. These are amazing! Thanks for attempting and sharing.